The creation of the University of Juba in the context of the Sudanese civil wars. Parallels can be drawn between the history of (higher) education and a history of subordination, colonialism and conflict in what is contemporarily known as South Sudan. Successive regimes, both foreign and domestic, purposely impeded the development of educational systems in South Sudan and the minimum of education provided by Christian missionaries, the Anglo-Egyptian colonial administration and Sudanese regimes often served propagandistic intentions. Venansio Muludian, a Professor in Demography and one of the pioneer faculty of the University of Juba who devoted the larger share of his academic career teaching at and administrating the University of Juba, condenses the complex history of the University of Juba in simple terms: “The University of Juba was established, it ran for some time, got displaced, went to Khartoum, continued operating there, it came back to the South and now it is continuing”. 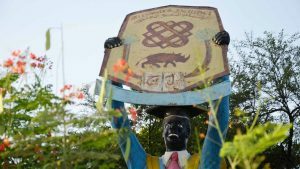 A statue placed near one of the University’s gates represents a graduate student raising with pride the University of Juba’s symbol bearing its motto: “Relevance and Excellence”. The foundation of the University of Juba was laid during the Round Table Conference in Khartoum in March 1965, when Southern delegates to the Round Table requested for a university to be established in the South. Another decade would lapse before Jaafar Nimeiri, the then-president of Sudan, decreed the establishment of the University of Juba in 1975 in order to address the inequity in higher education institutions. The University of Juba was inaugurated on the 6th of October 1977 and Professor Muludian, who as a newly appointed teaching assistant was present during the inauguration ceremony, remembers a festive and dancing Nimeiri showered in praises for fulfilling a long- ignored popular demand. A popular song of the seventies, composed by a folklore group from Yei in Juba Arabic sings: “Nimeiri, you have done us a favour by opening a university in the South”. At its inception the University of Juba was perceived as a regional university, but according to Professor Muludian “it was national in character. (…) This university has produced South Sudanese and North Sudanese, Sudanese of different colours graduated from this university.” However, since South Sudan’s independence from Sudan the majority of Sudanese students and staff returned to or remained in the North and currently the student body and support and academic staff are predominantly from South Sudan. 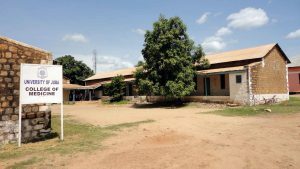 The premises that have housed the University of Juba for the past five decades were constructed in the 1950s during the military dictatorship of General Ibrahim Abboud. The infrastructure (class rooms, administration building and staff quarters) was intended to house the first secondary girls’ school in the southern region, but during the period of construction the first Anyanya war intensified and the school was occupied by a Sudanese military unit and turned into barracks. A history that would repeat itself decades later, when the mujahedeen – irregular, voluntary forces that were intimately connected to and collaborated with the Sudan Armed Forces (SAF) – moved into the University of Juba immediately after its administrative displacement to Khartoum in 1989. The University of Juba’s campus and students in 2018. 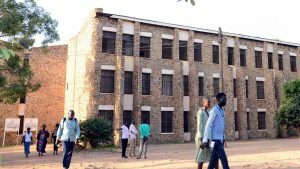 In the first decade of operation, the University of Juba housed five colleges and during the period of exile in Khartoum six additional colleges were added. In the period between 1989 and 2005 the student body also grew exponentially. According to Professor Muludian this was the result of a national revolution in higher education which increased the number of students in all public university and favoured admissions of students from the less developed states. 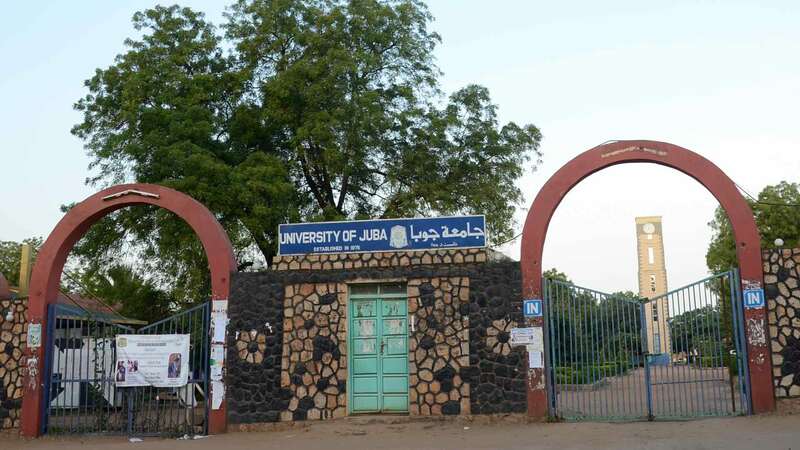 Since 2006 the University of Juba has been gradually transferred back to Juba and in December 2010 the last departments (Law, Social and Economic Studies and the final years of Medicine) were moved back from Khartoum to Juba. The first students returning to the South speak of the physical and spiritual remnants of war when they moved into the buildings that previously housed mujahedeen. They found the dormitories in a deplorable state and walls clad in the universal symbolism of detention: small lines marking off the days in imprisonment or military conscription. Stories circulate about the (evil) spirits of deceased soldiers and prisoners taking over the bodies of young female students. The former presence of SAF-allied soldiers creates a silent reminder of the conflict that influenced the lives of all students and that many had chosen to seek refuge for in Northern Sudan or neighbouring countries.